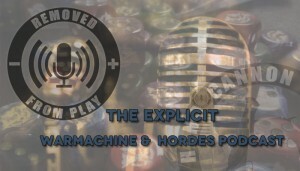 Hand Cannon Online has posted episode 61 of their Removed From Play podcast up online for your listening pleasure. The 61th episode of REMOVED FROM PLAY. Hosted by Charles (Omnus), and Emanuel (Bloodrath). This episode is an extension of episode 60. Anthony Ferraiolo is with us and we discuss which models from each faction that we think should be played more often than we see them. It was a really fun Control Area and I am sure you guys will enjoy it. Thanks for joining us Anthony.